Justin I. 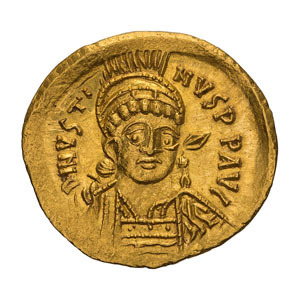 518-527 AD. Solidus, 4.51gg. (5h). 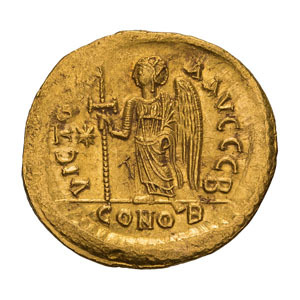 Constantinople, c. 518-9 AD. Obv: D N IVSTI - NVS PP AVG Helmeted bust front holding spear over shoulder and shield. Rx: VICTORIA AVGGG B Victory standing left, holding long cross topped with Christogram; to left, star; in exergue, CONOB. Berk 37. DO 1f. MIB 2. Sear 55. Mint State. Ex Berk 139, 4 August 2004, lot 35.